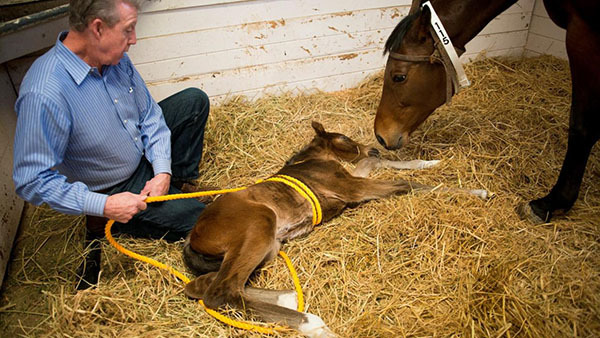 Equine veterinarians learned about the “Madigan Foal Squeeze Technique”—a life-saving procedure to immediately treat Maladjustment Syndrome in newborn foals—in the presentation UC Davis Distinguished Professor John Madigan gave at the 64th Annual American Association of Equine Practitioners (AAEP) Convention & Trade Show, held this past week in San Francisco. Dr. Madigan was one of 13 UC Davis faculty members, residents, and researchers who presented at the convention. With hundreds of informative and educational presentations, the AAEP convention is the largest gathering of equine veterinarians in the world. The convention allows equine clinicians, technicians, students and administrators to gather and share the depth and breadth of their expertise across the entire spectrum of equine medicine. Joining Dr. Madigan presenting at this year’s convention were Drs. Monica Aleman, Charlotte Easton-Jones, Pablo Espinosa, Carrie Finno, Scott Katzman, Isabelle Kilcoyne, Kelly Knickelbein, Heather Knych, Nicola Pusterla, Shara Sheldon, Betsy Vaughan and Mary Beth Whitcomb. Their presentations covered topics such as headshaking, laparoscopic surgery, colic surgery, equine coronavirus, ultrasonographic diagnosis and much more. Current and former faculty, residents and students also serve the AAEP on committees, in leadership roles and in many other ways. A highlight of the convention for UC Davis was the gathering of more than 200 current and former faculty, staff, students, and residents at the alumni reception, hosted by school’s Office of Advancement. The school also marketed its services with a booth at the convention’s trade show. Several staff members from the Veterinary Medical Teaching Hospital, Veterinary Genetics Laboratory, PCR Laboratory, and the Center for Equine Health helped highlight services available to clients. Finally, Dean Michael Lairmore and Director of Advancement Hyemi Sevening attended the convention to promote the development of the new Veterinary Medical Center, meeting with partners of that project to help open the world’s most comprehensive veterinary medicine facility on the UC Davis campus.